I've been talking about LINQ recently and the more I learn, the more I write as I think it is a well cool technology that I like talking about :) But if you're starting out and not sure how to start using LINQ what do you do? This post is level 100 so very high level and it is meant to give newcomers an overview on how to start with LINQ, ie what tools you need what version of Visual Studio, language versions supported platforms, what's supported on devices and finally some links to get started. You will need to use the new language features only available in C# 3.0 and VB 9.0 which can be used with Visual Studio 2008. I have shown code examples in C# but the concepts are the same for VB. 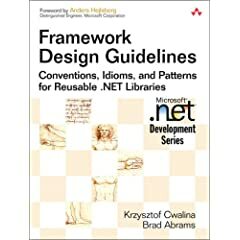 So you'll need at least Visual Studio 2008 and target 3.5 of the framework. One requirement to using LINQ to Entities which is a superset of LINQ to SQL is Visual Studio 2008 SP1 beta. VS SP1 beta adds the Entity Framework support to Visual Studio. Another nice feature worth mentioning and slightly related to LINQ, is support for SQL Server 2008 via Server Explorer - which is neat. Sadly no LINQ to SQL/Entities is supported as yet and there haven't been any announcements when and if it will be supported. You can use SQL Metal to generate the .dbml file for LINQ to SQL - but this will only work for SQL Compact on the desktop not device. I wrote an article recently about LINQ to Objects on the Compact Framework here. This post goes into a bit more detail. I've modelled this using SQL Server but I could have used quite a few different tools to do this. The schema is quite nice to work with and it would be nice to have an object model that represented this in code. As you can see we now have the two additional properties added to support the additional columns and also we have an Orders property which gives us access to all orders for each customer. That's it in terms of our object model. Nothing too complex. If we wanted, we could mark each class as Serializable so that if we wanted to serialize the data into binary we could (binary serializer is not supported on the CF) this is not required for XML serialization however. I do want to show an example of serializing this too as it adds an element of coolness to this example of how powerful we can make LINQ. So now we need some data. 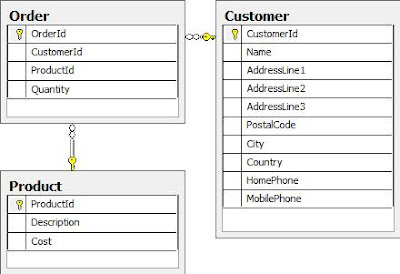 Normally you'd write some SQL to populate your object model as I mentioned in previous posts sadly LINQ to SQL and LINQ to ADO.NET/Entitys are not supported. So this hard work still has to be hand cranked. Although there is an ORM toolset available for the Compact Framework. You can find this here. I'd be interested in hearing from anyone their experiences of this toolset as I haven't personally tried it, yet. Description = "Table and chairs"
So we have 2 orders for customer Joe (id 1) and no orders for any other customer. Notice how the country is blank, why is this? Go back to where we create our object model - we never intialized the Country property. In fact, as we are using auto-implemented properties the property will in fact be null. Cleverly though the code doesn't blow up because the above is in fact a bug. Which would give us our first CustomerInfo object found in the collection. The var is in this case an IEnumerable and First is an extension method on IEnumerable. There are many extension methods on IEnumerable which I will show examples of how to use lambda expressions in queries. So far we have seen very simple queries. Now what if we wanted to do something more complex like find out which customers have placed orders totaling more than £100.00. We use a new feature of C# 3.0 called lambda expressions to do this which makes our code very short and easy to read. Lambda expressions are much like anonymous methods as introduced with C# 2.0. There are plenty of resources out in the community that talk about lambda expressions in depth. In fact whenever you use LINQ - for example in the simple examples above the compiler will be creating lambda expression calculations in the background, seemlessly. Of course you can explicitly use them yourself to add extra power. Here we have used extension method Sum on the IEnumerable interface then using lambda expression we are able to execute the query. How cool is that, in just 3 lines of code - that is the impressive thing here. That's it for this post, but in my next post Part 3 I talk about some more things you can do with LINQ. I wrote an article recently about writing comparer classes to sort data on the CF because LINQ to SQL is not supported on the Compact Framework. I did forget to mention LINQ to Objects which *is* supported on the Compact Framework and of course adds so much more power than writing a comparer class. So exactly the same results as both the IComparer and LINQ to SQL examples. Of course LINQ is a little bit more powerful than traditional IComparer code in that we can filter data without having to write much code or go back to the database - which is quite powerful. Bearing in mind these examples are only 1 dimensional objects, you can see the power when we have related objects. I will show some more complex examples in another post. Which gives us two results as with have a John and a Joe in our list of data. Typically though, that list would normally have been returned from a data layer in your application and instead of going back to the database to filter, sort etc, you'd use LINQ instead which will improve performance no-end. This is also quite powerful if you are retrieving your data from a remote server, you wouldn't want to do another round trip to filter or sort results. The really exciting thing about all this code is that it will run against your existing custo strongly typed collections and that is very powerful. UPDATE: See part 2 of this series here. I decided recently to build a Windows Vista machine to use on my network LAN at home and I thought I'd share my experiences here. This should have been a fairly simple task but turned out to be a bit of a nightmare but I finally got through it..... in the end. Mouse: Acme laser something....need to get a decent mouse. 1. 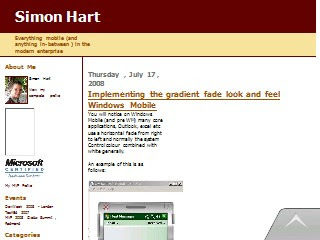 Ugly: The first thing was to check the monitor didn't have any dead pixels. So I simply hooked this upto my ancient laptop, luckily the ancient laptop has a VGA port and the cool Samsung supports VGA! Now did the monitor have any dead pixels,Guess what, it did. This is unusal for Samsung, they have a zero dead pixel policy even though PC World told me otherwise! Having said this PC world replaced the deal pixel monitor with no problems. 2. Ugly: When the last component arrived from ebuyer the Coolermaster Elite 330 with the processor I was finally ready to build this machine. After several hours of putting it all together it failed to boot, just wouldn't turn on. I figured it might be a lack of power because the board is a bit of a beast. So I hooked up the additional 2x4 12v power connector in hope the board will have enough power from the PSU. And it turned on! but it just kept on rebooting. You could hear the HDD kick in, fans etc and before any output was displayed on the screen it would reboot as if it was in an endless loop. After a bit of diagnostics, I found out there was a CMOS checksum error, so I decided to try and short (reset) the CMOS to see if that fixed the problem. It didn't, sadly. The motherboard was then sent back to the supplier for repair as I bought this motherboard more than 6 months earlier I didn't get a new one. I just hadn't had the time to built it. The fixed motherboard arrived while I was away around 2 weeks later so I was quite excited that I might have a working board and moments away from a running system as these days building PC's is much easier than they used to be. So lets start again! The board waiting to be unpacked. It's a very nice looking board. 1. In the picture above, I've added the CPU and the memory (memory in dual mode as the board supports it). The stock fan was very difficult to install. Today these fans come with these springy type mounts that click into place. They no longer just stick onto of the CPU as they need very tight contact with the CPU to disperse as much heat as possible - multi-core CPUs run very hot. Getting all mounts through the motherboard was quite a task! You also need some conducting lube to help with heat flow. The case comes with a 120mm stock fan to draw heat from the CPU. It doesn't have any BIOS regulator as it doesn't connect to the motherboard so there is no way to control the speed of it. This is unlike the CPU fan. All we have to do is hook it up to one of the power cables. We do not have to install the PSU as it comes pre-installed. 2. Before we insert the board we will need to install the HDD so it makes it easier to get it in before we install the motherboard. This case (Coolermaster Elite 330) contains the quick release drive sockets so we do not have to use a screwdriver - this feature I really liked. The case has another similar features for expansion cards. But to be honest, I used screws in addition to using the quick release gadget in the case as it didn't seem to secure the cards well enough in place for my likeing. 3. Now its time to install the CD ROM drive. Before we do this we need to prepare a bay for the drive to be installed. The drive will not be flush against the case here, it will be flush againt the front of the case which is why it's sticking out a bit. 4. Now we need to hook up the IDE and power cables to the drive as it's an IDE drive. 5. Now we can install the motherboard into the case. Now we have the board inserted. The GA-P35-DQ6 is an ATX board so just fits without the hard disk drive touching any part of the board. 6. Now its time to install the graphics card. This graphics won't run a games like Crysis or COD4 on full graphics but I didn't build it for gaming, my xbox is for gaming. The case would support a much larger card such as the 8800 series without problems. 7. Now install the wireless NIC card. 8. Now we need to put the front of the case on. 9. We now need to install the external SATA blanking plate into the case and hook it up to the board. This enables us to plug in external HDD drives without somesort of caddy case. 10. We will need to install additional USB ports. I do not have any photos of doing this but it's a simple case of installing a plate and screwing it into place and hooking it up to the motherboard. 11. There are a couple of finishing touches required to complete this build. Hooking up the USB the headphone and MIC ports available on the front of the case to the board. Note in the picture below, we have one spare 2.5" bay. This can either be a floppy drive, or a compact flash multiple support card reader which I will probebly buy as this feature would be very useful. 12. Hook up the monitor to the graphics card (DVI support). You can see in the above picture the additional USB ports we installed. 12 in total! 13. Bluetooth support. I will use my bluetooth card - a gift from Microsoft :) This is a simple case of plugging it into one of the spare USB ports. 14. Installing the webcam. Again this is a simple case of plugging it into a spare USB port. And that is it. Finished. All that is required now is installation of all the software! A couple of points to make. 2 GB of RAM is not enough. Vista sits idle using around 50% load on 2GB so as soon as you start hammering it, remote desktop sessions, Visual Studio etc the memory usage increases upto around 70% which is when Vista becomes a little unstable. I have ordered some more memory to cope with this. The board supports dual memory too which helps on throughput. I don't recommend the KeySonic wireless 2.4 Ghz keyboard as it seems to disconnect on inactivity which then requires extra key presses to "wake it up". The next machine I am building is a Windows Server 2008 box, I will post my experience of that here! Students - Imagine Cup 2009 is now open! To learn more about the imagine cup see here. 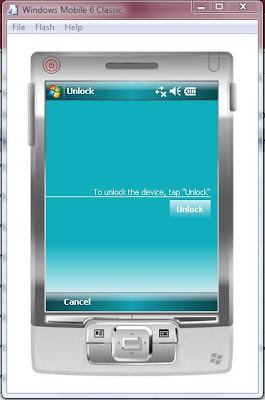 I wrote an article some time ago regarding locking down Windows Mobile here. 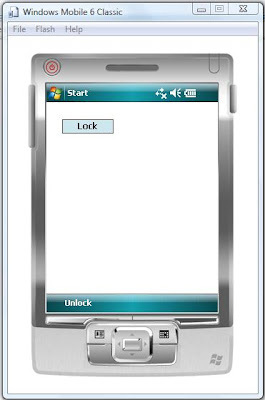 Someone emailed me to ask how do we go about creating a zero-byte file to "hide" the app as this is the only real way to lock down Windows Moble devices at present other than removing shortcuts etc as mentioned in the above post. A nicer approach is to handle the shortcuts so the end user can't get to the application in the first place. 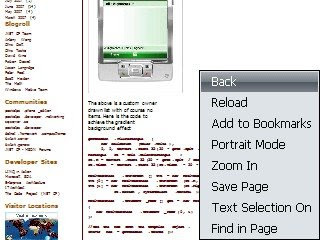 It is recomended to still create a zero-byte file as if we do not lock down file explorer, the user could be smart and try and load the app from within file explorer. //Check if the system we are about to remove is running or not. Note the above method uses the OpenNETCF Diagnostic library to get a collection of running programs. //We check both locations for shortcuts, the programs menu and the start menu. //Then access to Microsoft Pocket Internet Explorer is granted. //WM5 and onwards - default to start menu. //PPC 2003 - default to Programs folder. //We now need to delete the zero byte file, if found. //This file should always exist!!! //Then access to Microsoft Internet Explorer is denied. //to archive to ensure we can delete it. //archive to ensure we can delete it. There are a couple of points to make with the code above. Notice we are refering to two different locations as to where the shortcut (.lnk) might live, either the Start Menu or in the Programs group. This is because is varies, there is no set standard as to where we might find it. 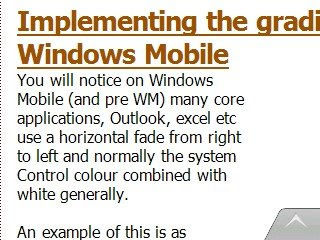 Also notice naming differences on older devices PPC 2003 to that of WM5/6.x. I mentioned recently the availability of Visual Studio 2008 SP1 Beta here. 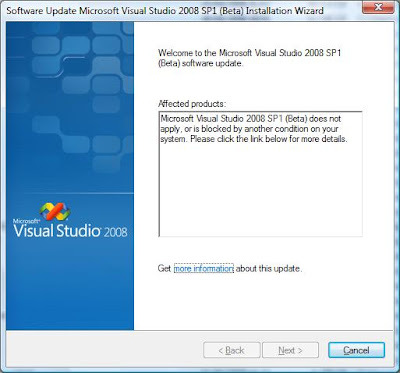 "Microsoft Visual Studio 2008 SP1 (Beta) does not apply, or is blocked by another condition on your system. Please click the link below for more details". To fix this, simply uninstall the Silverlight Tools Beta 1 package. 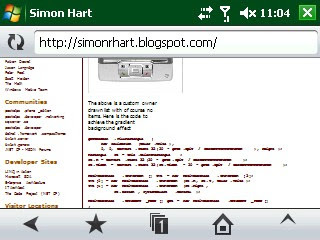 See the release notes for this SP here.